This is the first part of a series of articles featuring favored destinations in the Philippines. About half a million Korean tourists visited the Philippines last year accounting for about 18 percent of the total inbound market share — making Koreans the second largest visitors flocking to this archipelago in the Pacific region. With the current tourism slogan "More than the Usual Warmth: Feel the Philippines," the Seoul Times is coming up with this exclusive coverage. Sitting on sun-tanning wooden bed facing Manila Bay, take a deep breath and begin to empty your mind. 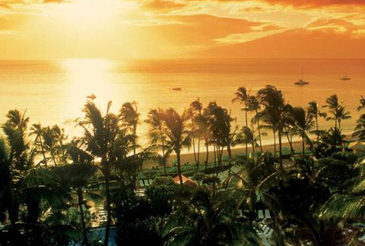 You're in paradise — a place that inspires oblivion to a world beset by chaos and drudgery. The sea is calm with silver sparkles created only by tiny waves while yachts, docked at a distance, are yet to set sail. The eternal breeze gently blows as the palm trees around dance away. For whoever wants to take a break from the troubled world and seeks for total relaxation of body and mind, think again of this place. Guests have come in droves — businessmen, honeymooners and ordinary couples, groups, families, the old, and the young; people of all ages are sights to see basking in the sun. Whatever is the reason for coming here, Hotel Philippine Plaza continuous to capture the hearts of many guests from around the world with its top-class facilities and quality services. Located on the reclaimed Manila Bay within the Cultural Center of the Philippine Complex, 6 km away from the Ninoy Aquino International Airport, the scenic location alone is unbeatable by any other deluxe hotels that can be found in the metropolis. Witness your day culminated by the sunset at Manila Bay — famed as the "world's most beautiful," for example. This spectacle, which can be glimpsed upon even when you're inside your room facing the bay, is sure to inspire your memorable stay. Not only that the natural setting can lift your spirit up. 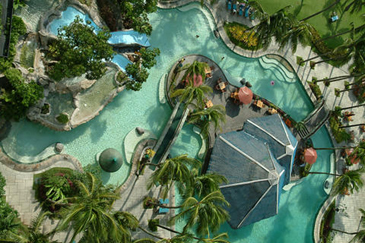 Turn around to the other side where the lagoon-inspired swimming pool encircling an open grill bar is located. The wooden bridge forms an arc on the water; then, there is a waterfall nearby. You can splash and swim in the pool all day, but at dusk, the poolside provides a more magnificent dining ambience. Here is the place to take guests to a gastronomic treat under the glow of moonlight. When you made Hotel Philippine Plaza a choice, you've not only checking in at one of Manila's most luxurious and comfortable accommodations, but more so, you have picked a host that welcomes you with a myriad of activities to fill your day — from sunrise to sundown. 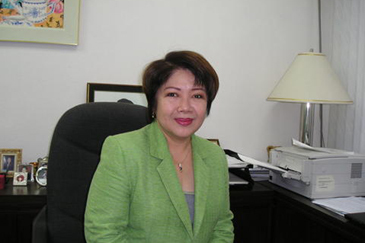 That's why Ms. Rose H. Libongco, the hotel's director for sales and marketing, is quite proud to admit that local and international guests — including the famous and important personalities — have come to choose Hotel Philippine Plaza. Here are some of the reasons: As soon as you get your morning call, you can get ready with your fitness and exercise. There's a Jogging Track & Circuit Challenge that can take you to a 500m winding path. Check your heart rate after that. See the test chart under a coconut tree. Next thing to do would be probably to take your breakfast at the Café Plaza. It sounds like you would get indulged on food, but no; there's an array of healthy food selection: cereals, oat meals, nuts, fresh fruits, fruit juices, and dairies — although there's a whole lot more for those who want a sumptuous breakfast. There's a place for sports enthusiasts. For golf buffs, the Golf Aqua Range — a mini aqua driving range — offers an opportunity to swing and tee off the ball to as far as 200m on the magnificent bay. It's one-of-a-kind where one can drive the ball into the waters. Boats are used to fish out back the balls. And right beside this aqua driving range, why not consider to stop by the 18-hole putting green. When you're traveling with children, fret not where to put your kids if you opt for a separate itinerary. The hotel is family-friendly. The Plaza Kids Camp, supervised by well-trained Plaza Team, is a place where children below 12 can enjoy the day. The first in the hotel industry, the Plaza Kids Camp is equipped with an audio visual room where kids can watch the latest Disney movie, for example. There's also an Internet and play stations. Various activities await children with so much fun — from face paintings and other creative crafts to baking cookies in cooperation with Nestle Food Services. On weekends, kids can go swimming or do Karate and Taekwondo. For kids who are more artistic, there are art activities like egg decoration, mug painting, and cooking classes. The Kids Camp opens at six and closes at 10 so you have all the time to enjoy your day while somebody takes care of your kid. At dusk, the sunset commands an awe-inspiring view which speaks well of nature's workmanship where one is compelled to go for soul searching. It only takes a moment to glimpse on the setting sun before it disappears from the horizon. Only the lens of a camera can retain the picturesque scene, if not etched in the memory. And soon silhouettes — of lovers, palm trees, or playful children — would be painted against the backdrop of a purple-colored sky. A sumptuous buffet, featuring barbecue and seafood grill by the poolside would be next in the agenda. "Fresh Off The Grill" menu at the Poolside Barbecue offers a wide selection of seafood — king scallops, tiger prawns, sea bass, and oysters. There are choices of meat — beef, pork, and venison. Beef lovers have a selection of US Angus beef with choice cuts such as sirloin, rib eye, tenderloin steak, T-bone, and Japanese Kobe beef rib eye. The buffet features a seafood, chicken and beef kebabs, tuna belly, mussels, squid, steak and salmon balanced off by fresh vegetables, fruits, grilled corn, potatoes and rice. Feast with the all-time Filipino favorite, Halo-Halo and endless heavenly desserts. For the grilled stuff, just pick your choice and give to the chef for grilling. It will be soon delivered to your dining table. Traditional beats and rhythm compliment fine dining. A dance troupe will entertain diners with folk dances flaunting the rich and diverse Filipino traditions. Here's an event that showcases folk dances from the Cordillera region, the lowland barrios, Muslim Mindanao as well dances with Spanish influence. Hence, you don't need to look for another place to see a Filipino indigenous performance. It's all there at the poolside. If your'e fatigued by your daytime appointments, feel free to rejuvenate and pamper yourself at the 24-hour Sports Club & Spa. At the spa, natural sound soothes your mind and spirit as soon as you enter the Thai-inspired ambience. Sounds of waterfalls, wind, sea — titillates your ears as you wait for your turn for total pampering. Here, the place offers a plethora of wellness and beauty programs. State-of-the-art spa facilities are equipped in both— steam room, sauna, cold plunge pool, and hot whirlpool, massage room, and treatment clinic. Managed by Dr. Joel Mendez, a diplomat of the Philippine Board of Bariatric Medicine and president of the Anti-Aging Society of the Philippines, he is well-known health and fitness consultant to stars and celebrities. Professionally trained masseuses and therapists have specialized in all types of massage methods either at the massage rooms, at the scenic poolside, or in the comfort of guest's hotel room. The Sports Club & Spa, has actually, put Hotel Philippine Plaza as one of the "wellness destinations" among the many resorts throughout the nation which are now being positioned by the Department of Tourism (DOT) for foreign guests. Choose massage techniques ranging from Shiatsu, Swedish, Combination, Reflexology, Aromatherapy, or the indigenous "Hilot" therapeutic massage. The spa also offers a variety of facial and body treatments as well as doctor-supervised weight management program. The spa is not only for wellness, but for beauty as well, stressed Ms. Rose Libongco. For middle-aged women, for example, who are conscious about the way they look, she endorses the "Diamond Peel —" a special treatment designed to make women look younger. In fact, while undergoing the facial treatment, a reflexologist can, at the same time, massage the soles and heels of your feet, legs, arms and hands. And the experience can be perfected with finishing touches of manicure and pedicure, for instance. You are sure to rise up seeing your face cleansed — glowing with supple and youthful look and totally refreshed! World-class celebrities have come to indulge themselves at the Hotel Philippine Plaza. Name it, and you have it. The hotel specifically boasts its Imperial Suite, among the 611 guestrooms comprising the hotel, which has become a choice of world's famous personalities, including the oldies legend Frank Sinatra, Luciano Pavarotti, Janet Jackson, former US Vice Pres. Dan Quayle, former US Sec. of State George Schultz, and James Ferragamo. 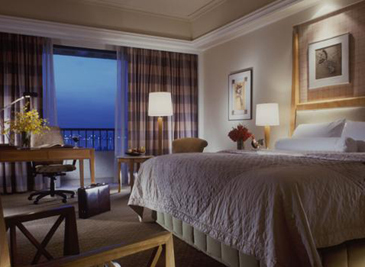 Not only its Imperial Suite has drawn world's Who's Who. Others include Brooke Shields, Franco Nero, Van Cliburn (concert pianist), Jeremy Irons, Priscilla Presley, Dame Margot Fonteyn (prima ballerina), Tina Turner, Pia Zadora, Kenny Loggins, and more. Located on the topmost floor, you can be on top of the world lording over the panoramic view of Metro Manila. A place that provided access with a helipad, the Imperial Suite has a spacious receptions room highlighted by elegant interior design combining East and West with centuries-old Venetian chandeliers, antique furniture and contemporary art pieces by local masters. There are eight rooms with a living room and a kitchen. Two of them are exclusively for use of "the master and lady of the house" with separate room for guests and children. Things have been cooking up. With the management takeover of the prestigious Accor Group of hotel chains, Hotel Philippine Plaza is poised to take a continuous blast. A multi-million renovation project has been undertaken to build Asia's largest indoor and outdoor restaurant costing a whopping $2.5 million. Artistically designed by Spin Design Studio of Japan and Creative Kitchen Planners International of Malaysia, the restaurant will be transformed into a major dining outlet featuring a wide array of the world's greatest cuisines — Western and Mediterranean, Indian, Italian, Chinese, and Japanese including grills, seafood, and an extensive dessert station. Creative Kitchen Planners has designed various hotel projects in Asia — from Shanghai, Bali, and Phuket. A 480-seat capacity, each food section will have different environments, which will be achieved through the installation of dramatic lighting so that dining patrons could dine at different times of the day and experience a new ambience each time. Ms. Libongco echoes what the planners say: "one needs to visit the restaurant many times to determine a favorite seat and to judge a favorite food." The restaurant is expected to open in March this year. Renovation of 280 rooms on five floors this year has to be undertaken as well to improve quality of existing facilities. "But it will be business as usual while the renovation is ongoing," Ms. Libongco continues. Already, Hotel Philippine Plaza is noted as a top "Meeting, Incentive, Convention, and Exhibition" (MICE) venue. 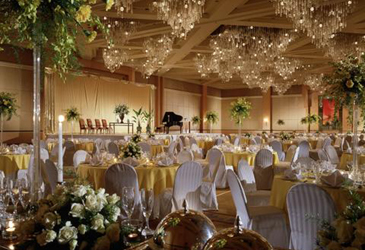 It boasts its Grand Ballroom with 1,500 pax capacity and 12 meeting rooms. The hotel's lush tropical gardens and sprawling grounds are also home to the Harbor Garden Tent with 2,800 pax capacity and the Sunset Pavilion Tent with 700 pax capacity. These are function rooms offering meeting planners unique and truly flexible venue options. Hotel Philippine Plaza was one of the 21 representatives who participated in the Fourth Hotel and Resort Road Show led by Philippine DOT Secretary Joseph Durano in Seoul and Busan in early November last year. Ms. Libongco enthused that her participation was inspired by Korean arrivals in the Philippines in general and Korean guests' impressive hotel room occupancy at Philippine Plaza in particular. In fact, the hotel has been tagged as "Koreans most favored hotel" in Manila. Statistics can prove it. Currently, Koreans now occupy an impressive 77 percent of the total hotel accommodation rate — outnumbering any other foreign guests at the hotel. The ubiquitous Korean is becoming more evident for various reasons why they come to the Philippines. Ms. Libongco is optimistic that Koreans will keep coming to the hotel in the years to come. She says that the hotel management has developed a good relationship with travel operators and airlines to give priority to Korean guests. She said the hotel has an integrated services and facilities that cater to the Korean market, and the management is constantly developing new ideas to improve services to ensure that Koreans are satisfied at Philippine Plaza. "We are happy to have the Koreans as our guests and we find many of them to be ideal guests who are interested in Manila and the Philippines and the destinations we have to offer," she concludes.